Terminal Station: Decatur St. Streetscape Starting Soon! Finally, two years after this project was supposed to be completed, the Decatur Street Pedestrian Improvements in downtown Atlanta will be starting soon. The project was awarded to JHC Corporation back in December 2008, for a cool $1.5 million. 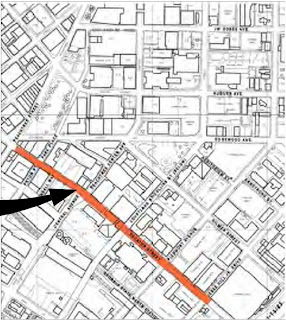 Work will take place on the half-mile stretch of Decatur Street between Peachtree St. and Jessie Hill Jr. Drive. This is right through the "heart" of Georgia State University. East of Pryor St., Decatur St. will be narrowed to one lane in each direction, with turn lanes. Sidewalks will be widened to finally accommodate the volume of students (no fancy paving, just broom-finished concrete). New roadway lighting will be added, and existing lighting will be painted CODA green (same green that Central Atlanta Progress and Midtown Alliance uses on everything.) Pedestrian-scale lighting will be added. Also, being an avid cyclist, I would have like to seen bike lanes added, but seeing as this wasn't mentioned in the "Imagine Downtown" plan, not much else I can say about it. In talking with people familiar with the project, I was told that the only thing holding up the project from starting is a "Letter to Proceed with Construction" from the GADOT. Apparently this letter has been delayed for a couple of months. To find out what the holdup was, I first called the Division 7 office of GADOT, and they had no record related to the state project number (STP-0004-00(465)) assigned to the project (somewhat concerning?). I then called Mark McKinnon, who handles Public Relations with the GADOT. He assured me that the letter to proceed was to be issued within two weeks. Not sure if this is moving again due to today's firing of Commissioner Gena Evans who had "slowed road spending to a trickle." According to a source inside the DOT, there is quite a backlog of projects waiting to be approved there. Once the letter is issued, expect construction to last 7-9 months. I'm waiting for some renderings from the design architect. I'll post them as soon as I get them. For more information or to look at the plans, visit the project information page. Glad to hear. I sometimes walk to downtown from the MLK Marta via Decatur St. and it's not always the most pleasant walk, ahem! I want to see them make every street in the city accessible to walkers BECAUSE IT'S A CITY!!!! The suburbs can be suburban all they want but Decatur St. is clearly in the city and needs to accommodate pedestrians. I would also like to see them do something about Boulevard as it crosses over I-20. People do walk there and it's a bit precarious in some spots, with cars exiting I-20. Thanks for the update on this. I've wondered what the heck was going on. These changes will make my commute a lot more interesting, but in the name of a more walkable downtown, I will grin and bear it. Edgewood is about to get a lot more congested.